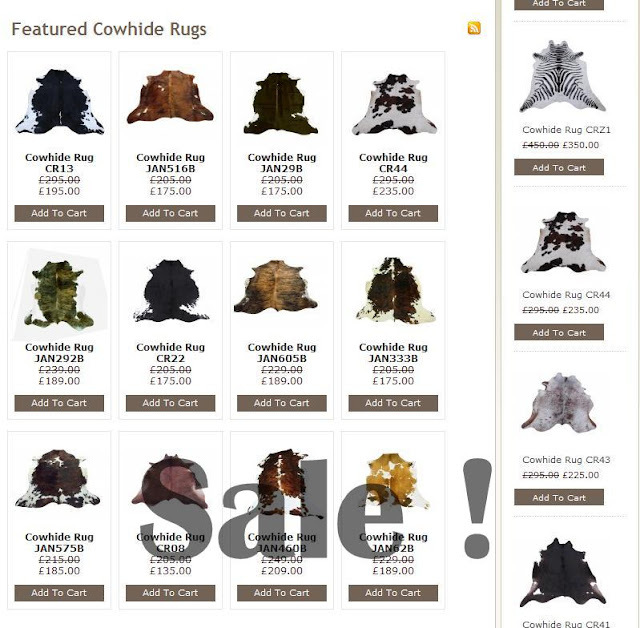 Cow Hide Rugs Christmas Sale now on ! Welcome to the new look blog for Cow Hide Rugs. We’ve moved our popular blog about all things cowhide and cowhide rugs and accessories from Google’s Blogger software to the much more popular WordPress software and the new url for our blog is http://www.cowhiderugsblog.co.uk . So we don’t lose any of our older Blogger cowhide blog posts we have imported them into this new account – you may notice some minor formatting issues. With Christmas coming up it’s an exciting time for Cow Hide Rugs and to celebrate this we have some extra special low sale prices on – for instance a black and white cowhide rug featured above has a whopping £100 off our already low price of £295. How do we do it at Cow Hide Rugs – by importing large volumes of cowhides direct from the producer and only selling online so we can pass on our massive savings on cowhide to you the customer direct. So if its cowhide, cowhide rugs or cow hide accessories you’re after then look no further you’ve come to the right place for all things cowhide!